ARISSat-1 is starting to come closer to Earth more and more each day. It is currently orbiting between 258 and 246 kilometers. Rough predicts have it re-entering in about a month. 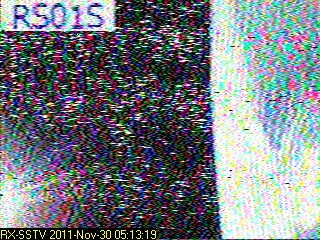 Many great images are coming in with all the ground stations listening. The satellite should be entering a period of a mostly illuminated orbit during early January so this will probably be the last chance for stations worldwide to hear it and try to capture data or monitor audio for the various contests associated with the satellite. Don't forget to update your element sets daily for best possible tracking results. ARISSat-1 is starting to reach the northern hemisphere just before entering eclipse. It should begin being much more available to stations in Europe, Asia and North America in the late afternoon and early evening in the next week. After that period, its orbit will slowly correlate to earlier times in the day. ARISSat is currently orbiting between 301 Km and 291 Km above the Earth. 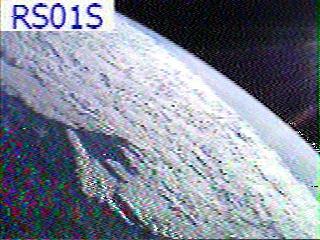 VK7OO has setup a blog site that automatically captures and posts images received from ARISSat-1. The antenna is minimal so the quality of the images is not supreme but it is an interesting concept. Check it out at http://vk7oo.tasme.com/sstvsat/index22.html and maybe a few more like this will pop up before the end of the mission. This image captured by VK6FH in Australia is our first for the month of December. ARISSat-1 is currently orbiting a little over 300 kilometers above the Earth and should continue to do so for most (if not all) of the month. It will be most interesting to see the images captured right before the satellite re-enters so keep monitoring as we don't yet know when the last image will be transmitted.